I didn’t like my bottle of the new(er) Bunnahabhain 12 so very much. Let’s see if this new version of the 18 yo is more to my liking. (I have not had the previous incarnation of the Bunnahabhain 18 at the lower strength and so cannot compare the two.) I think I may have read that this is entirely sherry matured, but I am not sure about that. Bunnahabhain 18 (46.3%; from my own bottle). Nose: Honeyed sweetness, almost cloying at first. A very clean coastal aroma–sea air, but not intensely salty, and no rotting seaweed. Toffee and cream and a touch of vanilla. A very appetizing nose–I mean that literally: smelling this whisky is almost making me hungry. A malty note emerges later along with some rich fruit (baked apples? some citrus too) and a touch of woody spice. Very nice indeed. Doesn’t call out for water, but let’s see what a drop or three does for it: brings the wood out a little more and de-emphasizes the honey and toffee. Palate: Quite obviously sherried, but there’s no sign of sulphur anywhere. And it’s far from a sherry bomb–no tannic bite, just a soft, mellow sherried goodness. Again, briny but not intensely salty. After the swallow the sherry separates a little, and there’s just the slightest hint of gunpowder/matches. A little bit of resiny wood as well. Gets a little saltier with time, a touch more acidic. Water kind of blands it out. Finish: Medium, briny (saltier now), with expanding wood spice. Water makes it a little more astringent at the end. Comments: I liked the nose the most, but this is really quite good, with no real flaws. Not the most complex whisky but very pleasurable: one that almost any whisky drinker would like, I think (now I am sure I will read that most geeks hate it). I don’t think water is a good idea. The style of sherry reminds me a little of the current Springbank 15, except without the more leathery brine and the stronger notes of gunpowder in that whisky (or at least in my current bottle). It’s hard to tell how much of the difference in qualities has to do with the 6 extra years of maturation and how much to a different configuration of casks being used for the 18 yo, but this is far more refined than the 12 yo (it’s also almost twice the price). And speaking of money, when you compare the price to that of the Highland Park 18 or the Springbank 18 (let’s not mention the Macallan 18) it almost begins to look like good value. Almost. 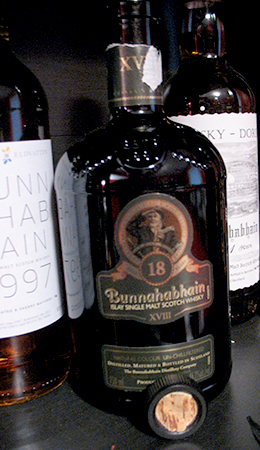 This entry was posted in -Whisky by Rating, 85-89 points, Bunnahabhain. Bookmark the permalink. I agree with your review of the Bunnahabhain 18. In addition to your notes I pull creamy cocoa out of the nose and palate. As you noted no water needed and it is not overly complex, but I really enjoy this single malt for those times when I just want to sit on the porch and enjoy something really tasty. It is usually reasonably priced in my part of the world so I usually have an open bottle in the cupboard. I’ve come back to this bottle tonight after a long time and that creamy cocoa thing you mention is very pronounced. And very nice. And for those interested in these things, despite having been open and below the halfway mark for almost a year, this bottle has not seen any degradation. The only change I can find is the one I just noted and it’s a very positive one. And almost six months after the previous comment I’m tasting it again, and still no sign of degradation. The toffee/cocoa thing is now very clear on the palate and blended nicely with the honeyed malt. Lovely whisky.